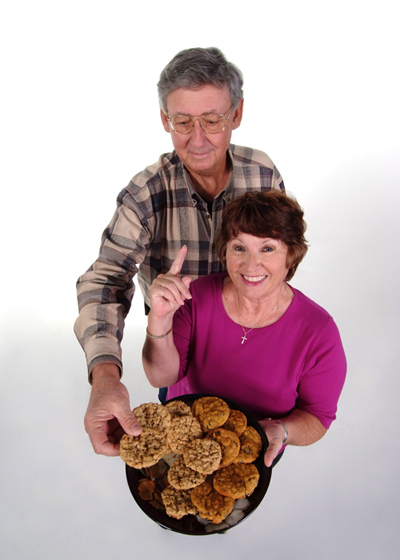 Sharon Schaffer “is the world’s best cookie baker,” according to Richard, her husband of 50 years. The two strokes the Torrington, Wyoming woman experienced a year ago haven’t changed his opinion at all. Sharon suffered a mild stroke one October morning while drinking coffee. She felt an odd feeling on the side of her face and got up and tried to move. She was making funny noises rather than talking. Richard recognized the stroke symptoms immediately and called 911. After a quick visit to a local hospital, Richard drove Sharon to Regional West Medical Center. She was treated and dismissed, but three days later, she experienced a more serious stroke during the night. Sharon was admitted to the Progressive Care Unit at Regional West then moved four days later to the Acute Rehabilitation Unit (ARU), where she spent three weeks regaining the strength and skills to return home. The Schaffers “can’t say enough” about the wonderful care and therapy Sharon received. “Gene, Sue, all the nurses ― they took such wonderful care of her,” said Richard. The Schaffers were so impressed and grateful, that both now volunteer to serve on the ARU Patient Advisory Council and to visit acute rehabilitation patients. “I’ve come a long way, but it’s been a long trip!” said Sharon.